Get timely information. Learn from the experiences of your peers and industry experts. Ask questions that could impact your decisions and improve your business results. Join a Beck Ag conversation and you have the opportunity to listen and learn how to increase the effectiveness and efficiency of your business. These conversations are sponsored by agricultural companies that value helping you with the challenges you face. Our programs bring together leading industry experts, experienced peers, and relevant solution providers, allowing them to connect in facilitated conversations that benefit everyone. Sometimes it only takes a short conversation to change how you feel about something forever. Listen to Beck Ag director Vernon Benes discuss the ESM. Experience-Sharing Marketing consists of connecting through conversations, sharing knowledge and solutions with those who have had real-life experiences. Beck Ag is the industry’s third-party facilitator of these conversations. Over the years, we have helped hundreds of thousands of ag professionals connect and share experiences. 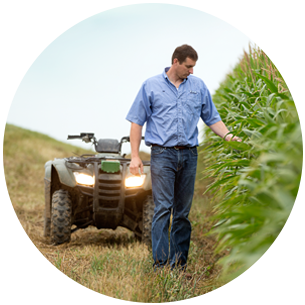 Beck Ag has facilitated more than a million conversations that allowed ag professionals to connect and learn from one another’s experiences. The impact of Beck Ag’s word-of-mouth Experience-Sharing Marketing activities is easy to verify. To date, more than 4,500 ag professionals have been interviewed in three separate research studies to measure the outcomes of participating in Beck Ag’s Experience-Sharing Marketing strategies. All three studies yielded similar results. When a Beck Ag specialist connects with you on behalf of one our sponsors, it is likely the topic will be one of value to you and your business. What does saying “yes” mean? If your schedule allows, just say “yes” and we do the rest. We confirm all your contact information and send you materials that will be used as part of the conversation and serve as a resource afterwards. With your permission, we also send you reminder emails and/or text messages. When it’s time for the discussion, we call out to connect you so that you can just relax, listen and learn. At various points, our professional moderators will ask you for any questions you have so that you can join the conversation. Asking questions is optional, you may just listen in if you prefer. Following the session, we will provide you with additional materials and information to help you apply and share what you learned. The specialists who contact you and the moderators who guide the conversations are all experienced industry professionals. They communicate well and know the topics. These men and women understand agriculture because they live it every day; many are past or present farmers, retailers and industry suppliers. Just one hour of your time could help you better manage your business. Learning from experts and peers who share their experiences may give you new insight about a product, a service or a technique that you can use in making your business more effective, more efficient and ultimately more profitable and successful. Gary Bailey shares his thoughts. Dave Asmus shares his thoughts. Allen Keegle shares his thoughts. Ready to work together, engage in one or more of Beck Ag’s data-driven, go-to-market strategies, or obtain additional information? Let’s talk! We will demonstrate how Beck Ag can make a positive difference in your business.